VO2 max, or maximal oxygen consumption, refers to the maximum amount of oxygen that an individual can utilize during intense or maximal aerobic capacity exercise. Your fitness level, how cardiovascularly fit your body is and how it compares to others your age. Customized Heart Rate training zones for optimizing training programs or weight loss to suit your goals. Aerobic, lactate and anaerobic threshold zones. How to most effectively increase your VO2 aerobic capacity. Yes. Please make your appointment in advance. We can serve walk-ups if there is room in the schedule, but our appointments receive first priority. Additionally, our NW DC office is by appointment only, and our technician staff may not be present if there are no reserved appointments. Finally, many of our scan dates do sell out, so there is no guarantee that we’ll have room for walk-ups. If your plans change, you can always change your appointment up to 24 hours beforehand. On average, your VO2 max appointment will take about 30 minutes. 5 minutes to get set up, 15-20 minutes testing, and a few minutes debriefing with the technician. How should I prepare for my VO2 Max test? Don’t consume caffeine for at least 4 hours prior to testing. Also, avoid smoking and strenuous exercise for 24 hours prior to testing. Come in (or bring) wearing comfortable clothes and shoes, and bring a towel! If you have a respiratory illness or any other condition that may affect your ability to run or ride at max effort, please schedule your test at a time where those conditions will no longer affect you. VO2 max quantifies of your cardiovascular fitness, and allows you to measure progress when training for competitions, or throughout your fitness program. 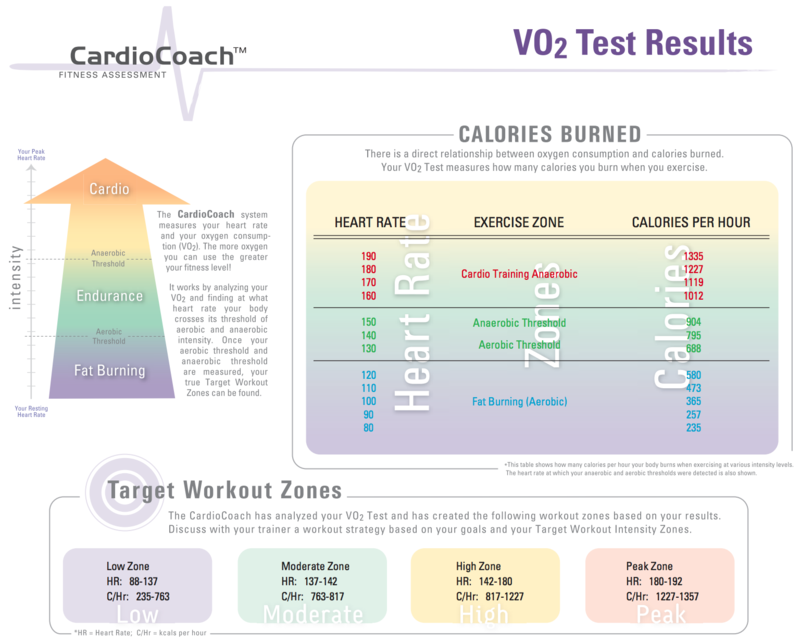 The VO2 max tests also measures your max heart HR and target heart rate training zones. This tells you at what heart rate you should be training at to meet different fitness goals. How often should I get VO2 Max tested? After your initial baseline, re-testing your VO2 max will depend on the changes in your fitness training. If you’re training for a competition or event, you might find it useful to test at the beginning of your training program, and then re-test immediately prior to their competition to see measurable change in cardiovascular capacity.